"I’m complicated, sentimental, lovable, honest, loyal, decent, generous, likable, and lonely. My personality is not split, it’s shredded." Jack Paar: As I Was Saying . . . Directed by Michael Macari Jr.
Jack Paar began his career in broadcasting as a young radio announcer in Cleveland and throughout the Midwest. During World War II, as part of a special services company that entertained troops in the South Pacific, he honed his talents as a monologist. In the early 1950s as an actor and comedian, he briefly tried his talents in the movies, including an appearance in the 1951 film LOVE NEST with then relatively unknown actress Marilyn Monroe. He made numerous appearances on Jack Benny’s radio show and such programs as THE ED SULLIVAN SHOW. 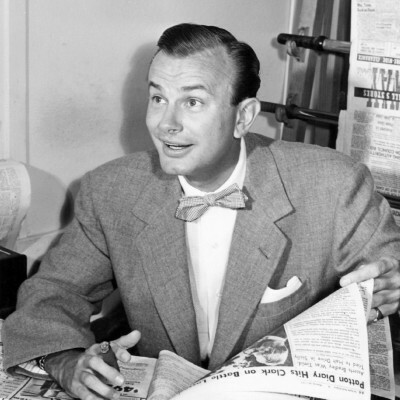 Throughout the early 1950s, Paar made regular television appearances and even hosted a game show, UP TO PAAR, and a morning variety show, THE JACK PAAR SHOW. It was not, however, until 1957 that he became the king of late-night television as host of THE TONIGHT SHOW. Eventually Paar’s popularity prompted NBC to rename it THE JACK PAAR SHOW. While Steve Allen had been THE TONIGHT SHOW’s first host, Paar turned it from a typical variety format to something completely different. With a rare combination of intelligence, irreverence, and intuition, he invented a new genre of programming that would become a mainstay of modern broadcasting. Paar’s career was not without turbulence and controversy, however. He was criticized for his interview with Fidel Castro in Cuba, and he caused an international incident when he broadcast his show from Berlin as the wall went up. He had countless feuds with columnists like Walter Winchell and Dorothy Kilgallen, and even quit the show briefly in 1960 after one of his jokes had been edited out without his knowledge. Almost in tears and clearly angry, Paar looked into the camera and said, “I am leaving THE TONIGHT SHOW. There must be a better way of making a living than this.” Though he returned to the show a few weeks later, he remained ill at ease with the executives. In 1962, Paar left the show permanently. After five successful years, he’d become weary of the grind of nightly television and sniping by the press. Paar wanted to spend more time with his wife and daughter and to branch out and travel. From 1962 to 1965, Paar hosted a weekly prime time variety show that retained much of the famous Paar charm. By the late 1960s, he reappeared once again, this time as the producer of prime time documentaries introducing Americans to the interesting curiosities and cultures of Japan, Africa, Asia, Europe, and more. It was this keen inquisitive nature that made his early shows so great and for which he will long be remembered. Jack Paar died on January 27, 2004 at the age of 85.